Valentine’s Day is tomorrow. In our house, my Valentine treat for my family is to have a simple and sweet family dinner – typically featuring breakfast food. I pull out the heart-shaped waffle iron that we received as an engagement gift 22 years ago and use that nasty red food coloring to turn the waffles pink. What would waffles be without strawberries, whipped cream and bacon on the side (although one of my daughters and I are pig-free kinda gals)? We have a candelight toast with sparkling apple cider, share the things we love best about each other and eat chocolate covered-strawberries for dessert. I force my family to play a game or participate in some activity that I, as Queen Mother, have deemed as “fun.” Last year we filmed our very own version of the Harlem Shake. No, It’s not on You Tube. Yes, we all look ridiculous. 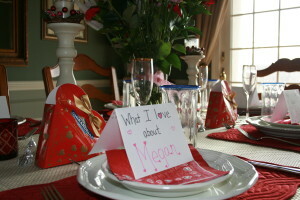 I hope my kids will always remember our Valentine dinners. Here are a few pictures. Nothing fancy or Pintrest-worthy. Just our simple tradition. 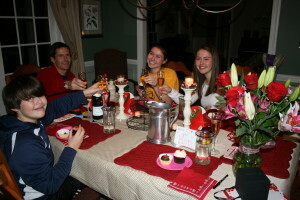 My FAVORITE part of our Valentine dinner is the conversation at the table. We’re all together. No one is running out the door and everyone stays around the table until dessert is gone. But its not just at Valentine’s Day when I appreciate conversation with my kids. It’s always. We know as adults that certain kids are natural conversationalist. You put them in any group of people and they make connections. But for the majority of our young people (and a lot of adults too), becoming a great conversationalist takes practice. Lots of practice, growing out of the many awkward stages of youth and being comfortable in your own skin. It takes confidence. And practice. Practice. Practice. This practice really needs to take place at home. Here are a few resources to support you as you give your child the gift of gab. Make sure you read all the way through. I saved the best for last. I LOVE, LOVE, LOVE Table Topics. If you aren’t familiar with these boxes of conversation topics for all occasions, check them out at Amazon. Do you see why I LOVE Table Topics?! They have boxes for all occasions: Happiness, Dinner Parties, Girls Night Out and What Would You Do? …just to name a few. They are a blast! Another web site that is fantastic for SO many reasons is Skip To My Lou. OK – Total Pintrest worthy stuff here! Don’t stop by if you’re prone to feeling like a slacker because you totally will after visiting the site! Recipes, printables, gift ideas and crafts you should be doing with your young kids when you barely have a moment to brush your teeth. 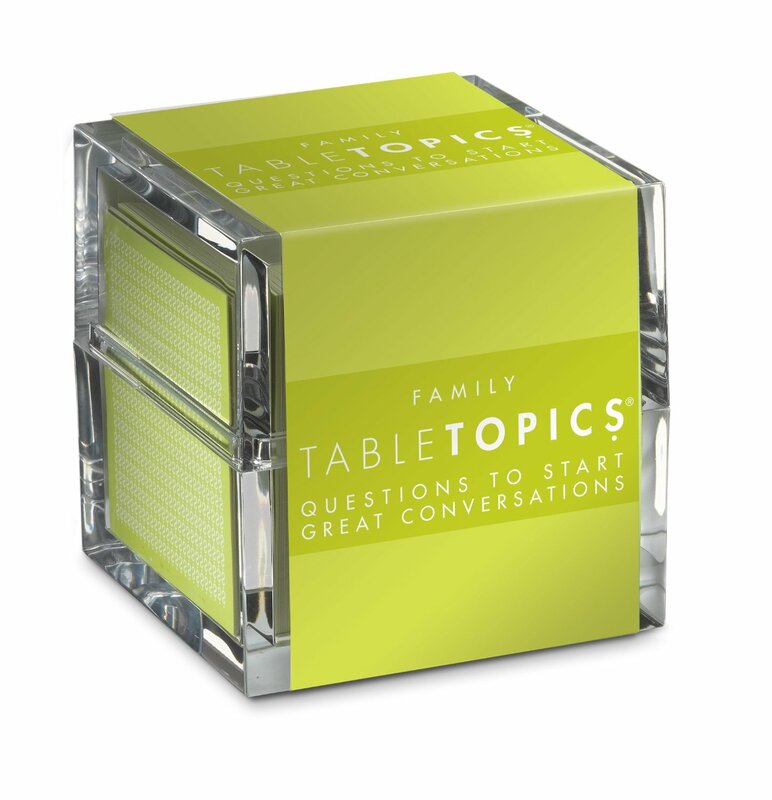 There are printable conversation starters for all occasions – Thanksgiving, Easter, Dinner Party, and Christmas. The best part is that the questions are interchangeable, so use them any time! Pass a basket around the table, let your fellow diners pick one, read it out loud and see what everyone has to say. Don’t make everyone take a turn answering, just go with the natural flow and let the conversation be genuine! One conversation topic creates another – all on its own. I have these sets printed out and use them regularly! Yep. I’m a proud Conversation Geek! Here are a few samples questions from Skip To My Lou. Look people in the eyes and practice active listening skills such as nodding of head and smiling. Don’t interrupt. Wait until the person finishes his/her thought before you chime in. This is hard to do when you have something to say! Make a positive comment or follow-up with a question relevant to what the person just said. Teach your kids what topics are not cool to chat about. This includes controversial topics, potty talk, putting others down and being negative. Remind your children that some topics that you discuss within the walls of your home do not go outside those walls. Kinda like putting the cereal bowl up to your mouth to get the last bit of milk. You might do it at home, but never out in public or at another’s house! Do your best to encourage your kids to take a lead in conversation. Help them be comfortable and confident. It will go far as they make new friends and talk to adults. I can promise you it will be a useful skill they will use for the rest of their lives. This Valentine’s Day as many of us dig out from the big snow storm on the east coast, use your time with your kids to show them your love by chatting with them and listening to them. Have fun!